It's finally happened: intelligent extraterrestrial life has visited Earth in the form of Klaatu (Michael Rennie), a slender humanoid from an unnamed planet. Sporting some terribly sparkly clothing and a beefy robotic bodyguard named Gort, the alien brings a message of peace, but with a dire warning that he insists every nation hear at the same time. 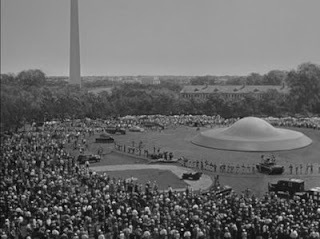 However, the nations of the planet are a bit preoccupied with politics and war, and have little time for weirdos who travel in flying saucers, so a frustrated Klaatu decides to mingle with the common folk in hopes of finding any way to deliver his urgent message. Under the name Mr. Carpenter, the space man walks among the humans undercover, eventually befriending little Bobby Benson (Billy Gray) and his mother Helen (Patricia Neal), enlisting their aid. Honestly, The Day the Earth Stood Still isn't a particularly great film on its own, and hasn't aged very well after 60 years. You expect visual effects to date themselves as they do here, but even the film's story and approach seems a bit simple and naive. But thanks particularly to some solid acting, the film's fearful call to peace still manages to hold some weight. Aside from the occassional fairly seamless matting effect, most of the films showy effects are just plain silly-lookin'. While Gort's entrance is striking to behold, the imposing, statuesque robot standing with intimidation on top of the spaceship, the effect falls apart as soon as he begins moving, his lifeless, rubbery arms wiggling as the pants of his costume bend awkwardly. Plus, with a head that size, Gort begins to resemble Shrek in a RoboCop suit. The effect of his Cyclops-esque laser beam would still be decent if it weren't for the Hanna-Barbera sound effects that accompany it. The unintentional comedy even bleeds over to the nontechnical, my favorite of which involves doctors speaking outside of Klaatu's room at a military hospital. They marvel at the alien's speed of recovery and young looks, considering his age, but they complain that he talks down to them, making them feel like third-class witch-doctors. Of course, as they discuss this, they light up a few cigarettes right there in the hospital hallway. The film's straight-forward plot and earnest but blatant theme do little to differentiate it from other sci-fi tales of the era (after all, aren't most classic science fiction stories merely metaphors for a specific cause or call to action? ), but The Day the Earth Stood Still bests many of them with its acting. Michael Rennie's Klaatu balances an other-worldliness (aided by the actor's sharp physique) with gentleness and wisdom. The actor is able to add some subtlety to some of the film's very direct declarations of theme. As Klaatu explains the tech specs of his flying saucer to little Bobby, he mentions how it harnesses atomic power, to which the boy points out that he thought that was for building bombs. Klaatu can't hold back a wry and somewhat sad smirk when he tells the kid that, no, it's used for other things as well, injecting the moment with much-needed poignancy. Patricia Neal, as Bobby's widow mother Helen, grounds the film with a performance nearly free of flash or histrionics. Her sincerity and calm keeps you in the story during important moments, as when she learns of Mr. Carpenter's true alien identity, or how she reacts when her boyfriend Tom rats out Klaatu for fame. While the film's message of peace and cooperation is without a doubt admirable, it's presented in a slightly puzzling way. During the film's climax, Klaatu explains to the Earthlings that the planets of the universe have eliminated any need for stupidity, and therefore war and strife, but they have done so by creating a race of merciless super-robots capable of planetary annihilation, and giving them permission to zap any being that gets out of line. So yeah, they've all stopped fighting, but only with the threat of intergalactic police brutality hanging over their heads, which Klaatu now extends to Earth. The "you better behave, or else" approach slightly undermines the call for peace and sensibility, but whatever works, I guess. Most impressive to me is how the film is able to represent Earth as one entity. Rarely do we view the people of this planet as one; instead, we group by city, state, province, region or nation, not to mention color, race and religion. Whatever it may be, there's always an "us" and there's always a "them" which is why it's difficult for "us" to be the entire planet Earth. Who would be "them" in that case? But from the beginning of The Day the Earth Stood Still, the message has been clear: for the survival of the planet, we absolutely must think of Earth as a whole. And not only is the film clear in this, it's actually convincing and clever in its approach. Pay attention to the language that Klaatu uses. He refers to our nation-to-nation dynamics not as "international affairs" but rather as "internal affairs." He brushes off our wars and issues as "petty squabbles" as if he were a visiting business consultant with no time for our meaningless interoffice politics — and in the grand scheme, perhaps that's all our squabbles really amount to. A still from the movie was used by Ringo Starr for his solo album 'Goodnight Vienna' from 1974. Ringo 'head' replaced Rennie's. The message of Klaatu in the movie, resonates in Ringo's personal sincerely used mantra 'peace and love'. The use of a still from the movie therefore makes sense, and was more meaningfull than most reviewers and fans ever understood.